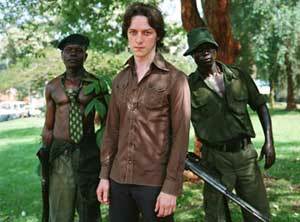 It's 1970, and when newly qualified doctor Nicholas Garrigan (James McAvoy) closes his eyes and picks a random destination from the globe in which to 'do some good' and have some adventures on the way, he couldn't have chosen a more volatile place than Uganda. 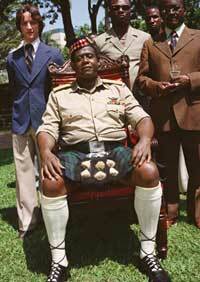 Assigned to an ill-equipped hospital in the middle of nowhere, the naïve, idealistic young chancer is dealt a little more adventure than he can handle when, almost accidentally, he finds himself acting as the personal physician to the country's new President, the military dictator Idi Amin (Forest Whitaker) - the Last King of Scotland, for so Amin styled himself, believing that, if he could drive the English from Uganda, he could do the same thing for the Scots. At first, the country welcomes their new leader with jubilation, believing he holds the key to a strong, independent African nation. And Nicholas too is initially bowled over by the overwhelming force, enthusiasm and charisma of his new employer and the power and OTT glamour of his lifestyle - so much so that he finds himself unwittingly turning a blind eye to a catalogue of bloody crimes that increase in severity in step with Amin's paranoia. Accepted into the bosom of dictator's family, Nicholas quickly makes the unlikely leap from doctor to trusted adviser - at the same time as suicidally leaping into bed with his boss's wife. But as the brutality and violence of the dictator's regime escalates and Garrigan's own position becomes ever more precarious, even he must open his eyes - with horrific results. The Last King of Scotland may only be 'inspired' by true events (Garrigan's character is apparently a composite of several different people) but it feels utterly real in its evocation of both the excitement and promise and the insecurity and terror of Amin's reign. Forest Whitaker gives the performance of a lifetime, and if he doesn't win an Oscar it'll be a crime to rival any of the dictator's own. 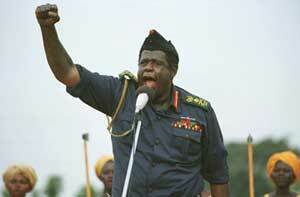 An immense, overpowering figure in his dress uniform, military fatigues or (gulp) kilt, his Amin is funny, exuberant, perceptive, loud, seductive and very, very scary. Charm personified one minute, a raging tyrant the next, a barrage of frenetic close-ups and erratic camera angles help to recreate the dizzying, frightening experience of standing in his unpredictable presence. And the man at the receiving end of this force of personality is up-and-coming Scottish superstar James McAvoy, who manages to hold his own admirably against Whitaker's heavyweight performance. With his floppy hair, self-deprecating smile and happy-go-lucky charm, he manages to retain our sympathy throughout - even if we do occasionally want to slap him. Amin's wife? What were you thinking?! Oh, and niiice shirts, by the way - yup, the '70s styling is spot on throughout, so watch out for those flyaway collars and 'fros. Yes, believe it or not it's okay to laugh, because although there are some truly harrowing moments in this film, there's also a lot of humour, as the unlikely and unbalanced friendship between Amin and Nicholas is established. This is not a dismal, po-faced documentary of terror, but a slice of history in the making that portrays the warmth, vibrancy and immediacy of Africa as passionately and convincingly as the horrors of Amin's reign, reflecting Uganda's continuing ambiguity towards the leader who brought his country freedom but at a terrible, terrible price. The themes of master vs slave, white vs black, paternalistic colonialism vs violent, rebellious independence (Garrigan himself calls Amin a 'child') are thought provoking rather than didactic - and, as Bono and his celebrity pals continue to extend their charitable hands across the ocean to help the poor Africans, and Scotland itself ratchets up the debate on independence, as pertinent as ever.